Wiggin Out | pop mitzvah! ← You down with G.O.T.? Let’s talk about the upcoming film adaptation of Orson Scott Card’s timeless YA novel, Ender’s Game. This project has been kicked around Hollywood for a long time, and I’ve seen at least 3 separate drafts of the script since development went into overdrive a couple years ago. On paper, the concept is ripe for film: in the near future, our planet is threatened by a sentient alien invasion, called the buggers. The genius children of the world are cultivated from birth to be humanity’s greatest military weapons. Our hero, Ender Wiggin, is a brilliant tactician handpicked for “Battle School” in space at six years old. 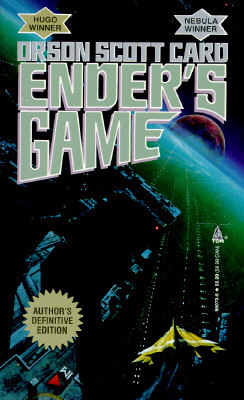 But on paper – the yellowed, fragrant paper of my 1991 copy – Ender’s Game goes way deeper than space adventure. Above all, the story is dark. And complex. It consists of three threads, braided together uncomfortably tight: politics, military strategy, and the peculiar culture and society of children. Most of the book is quite painful to read, because we experience it through the eyes of a little boy – intelligent enough to understand that he is both the prisoner and savior of all Earth, but emotionally unequipped to deal with the consequences. And they number many: isolation, depression, self-destructive fury. He works his way up to leading hundreds of children and teenagers through elaborate battles while slowly losing all hope. That’s the real crux of this book: an innocent losing his own life force in order to save billions. The passage below brilliantly illustrates EG‘s emotional core. Here Ender has already become a top leader, pitting him against his closest friend Alai. They are both nine years old. He passed Alai in the corridor, and they greeted each other, touched hands, talked, but they both knew that there was a wall now. It might be breached, that wall, sometime in the future, but for now the only real conversation between them was the roots that had already grown low and deep, under the wall, where they could not be broken. The most terrible thing, though, was the fear that the wall could never be breached, that in his heart Alai was glad of the separation, and was ready to be Ender’s enemy. For now that they could not be together, they must be infinitely apart, and what had been sure and unshakable was now fragile and insubstantial; from the moment we are not together, Alai is a stranger, for he has a life now that will be no part of mine, and that means that when I see him we will not know each other. Getting back to the film adaptation – I’m having a hard time seeing exactly how this movie will honor its source. In case you didn’t read the article I linked to, this is a Lionsgate franchise that will star Asa Butterfield as Ender, Abigail Breslin as his beloved sister, and Harrison Ford as the commander who plucks Ender from his family and molds him into a military machine. It is clearly a big-budget, high-publicity whirlwind that Lionsgate will attempt to parlay into an empire a la Twilight and The Hunger Games. It’s troubling. It feels like someone poured the novel into a sieve and is now rattling around CHILDREN, SPACE, WAR, ALIENS while all the nuance and atmopshere and political commentary lies in a sandy heap on the floor. The worst thing about all of this is the director at the helm: Gavin Hood. He has a clunky action-formula touch and his last credit was X-Men Origins: Wolverine. What’s interesting is that, there too, he made attempts to expose the psychology of a powerful outcast, but pretty much failed. Emotional payoff lost out in favor of dazzling displays of developing strength. That’s exactly what horrified Card. EG‘s action moments were big, but the lead-up, the down-time, the silences…they felt so much bigger. I guess what I’m getting at is that while this looked like a blockbuster, it should in fact be an indie film. Small and intimate. Inky black shadows, tension, elegant little bodies hurtling through zero-gravity caverns, pained eyes. Conversations between precocious devils barely old enough to shave. I’m thinking Darren Aronofsky or Sofia Coppola (who’s always had a soft spot for ruined youth). And the majesty of a film set in space deserves Terence Malick respect. Even Ridley-freaking-Scott would have been better. But this is the way film is made and marketed now. No longer can a huge movie rely solely on delicate storytelling and go to verboten places like having two kids attempt to murder each other in a shower. I mean, I can’t judge since the adaptation has still not even started production, but my expectations are low. Maybe it’s better that way. The further away the film is from the book, the more special Ender’s Game will become. The unfilmable novel. The haunting story that read differently to me every year as I grew up. My 23-year-old fingers brush a page and I remember curling up next to it ten years ago, in my own black endless space under the covers. Learning about the worst places my little mind could go. The reading experience was disturbing and confusing but so incredible. And if the film doesn’t take me there, the words in that ragged old book will pulse even brighter. The mystery and devastating tenderness of Ender’s Game will last beyond any Hollywood folly, long after the buggers come and annihilate us all. Beautifully written. I totally understand all those emotions. Not to sound like a hipster, but anyone that doesn’t love Ender’s Game….I don’t want them to discover it through a movie. Dude I didn’t know you had a blog! I’m def checking it out too. Also thanks for humoring my ridiculosity.